Uri McMillan is interested in nineteenth and twentieth-century performance cultures, and their particular intersection with literary cultures and visual art, with a particular emphasis on black performance art. He received his Ph.D from Yale University in 2009, where his dissertation was awarded the Sylvia Ardyn Boone Prize for best written-work by a graduate student on African or African-American Art. His first book, Embodied Avatars: The Art of Black Female Performance will be published on the Sexual Culture series, edited by Jose Munoz and Ann Pelligrini, and released by NYU Press in late 2014. In it, he argues that through an aesthetics of self-objectification, black women performers enacted striking and brave performances of alterity. He interprets these performances of objecthood–or the ways these social actors transformed themselves into art objects–through the concept of the avatar. In doing so, he re-renders “avatar” and its multiple meanings to gesture toward the synthetic selves enacted in black performance art. He is on leave for the 2013-2014 academic year, supported by a Career Enhancement Fellowship for Junior Faculty from the Woodrow Wilson Fellowship Foundation. His work has been supported by the Ford Foundation, Social Science Research Council, and the Beinecke Rare Book and Manuscript Library. 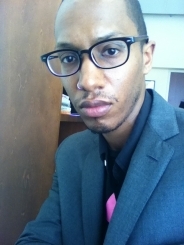 Professor McMillan has courtesy appointments in Afro-American Studies and Gender Studies, and sits on the faculty advisory committees for the LGBT Minor as well as the Disability Studies minor.